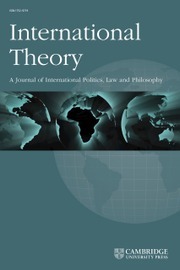 International Theory (IT) is a peer reviewed journal which promotes theoretical scholarship about the positive, legal, and normative aspects of world politics respectively. IT is open to theory of absolutely all varieties and from all disciplines, provided it addresses problems of politics, broadly defined and pertains to the international. IT welcomes scholarship that uses evidence from the real world to advance theoretical arguments. However, IT is intended as a forum where scholars can develop theoretical arguments in depth without an expectation of extensive empirical analysis. IT’s over-arching goal is to promote communication and engagement across theoretical and disciplinary traditions. IT puts a premium on contributors’ ability to reach as broad an audience as possible, both in the questions they engage and in their accessibility to other approaches. This might be done by addressing problems that can only be understood by combining multiple disciplinary discourses, like institutional design, or practical ethics; or by addressing phenomena that have broad ramifications, like civilizing processes in world politics, or the evolution of environmental norms. IT is also open to work that remains within one scholarly tradition, although in that case authors must make clear the horizon of their arguments in relation to other theoretical approaches.